Our group trips have been selling out at record pace and we are so excited to announce our last one of 2019; with a bit of a twist. Join us on our first ever citizen science expedition and once-in-a-lifetime experience with no scuba diving experience necessary. Together let's save the marlins and get front row seats to one of the oceans best (and most unknown) spectacles. 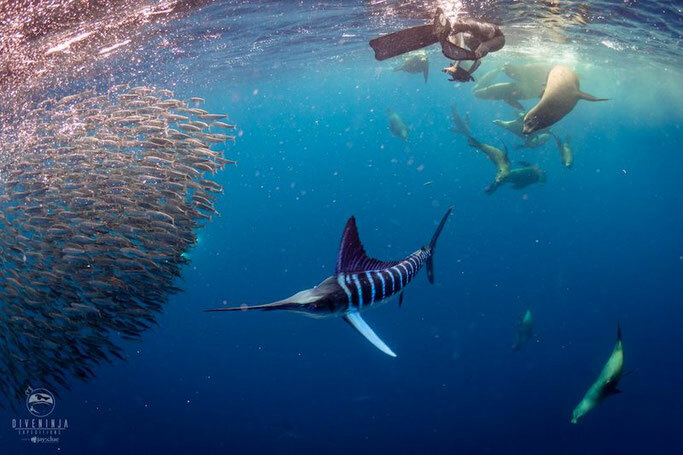 Striped Marlin are a magnificent apex predator that inhabit the waters off the coast of Baja California. Easily identified by their elongated bills (or noses) and brightly striped bodies, these fish are astounding swimmers built for speed and are mesmerizing to see in the open ocean. 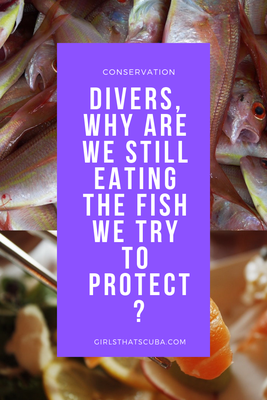 Unfortunately, they are fished commercially and also for sport, with an estimated 12,000 caught annually through recreational fishing activities near Cabo San Lucas alone. 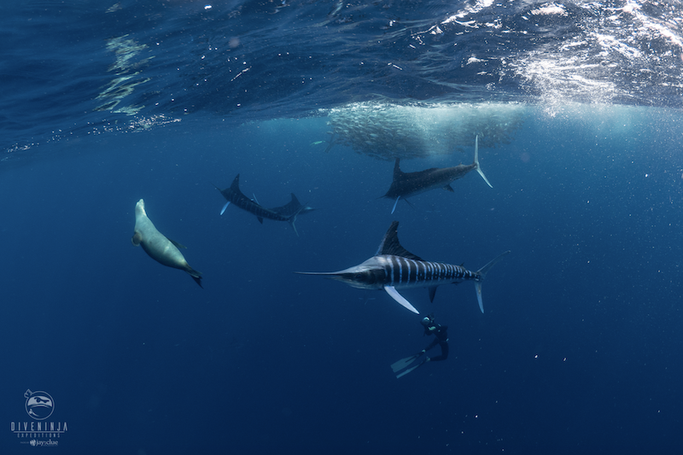 The IUCN Red List classifies the striped marlin as “near threatened” and in a state of population decline, meaning that this species may become threatened or endangered in the near future without the intervention of conservation efforts. Overfishing, both commercially and recreationally, are contributing to this serious issue. Not only will your trip with us bring you face to face in the water with these amazing fish, but you will also have the opportunity to get directly involved with research activities lead by Nakawe Project team, that will help us better understand their migration and biology. Your assistance during these expeditions will directly contribute towards conservation efforts to protect these remarkable creatures. Research activities will include surveys of the abundance & diversity of animals around the study area, including marlin, sea lions, dolphins, and more! You will also collect a suite of important environmental data to help us understand the types of conditions these animals are found in, including water temperature, dissolved oxygen, and turbidity. But, one of the biggest gaps in knowledge that this project hopes to fill is where and when striped marlin reproduce. It is currently thought that they migrate South in the summer months to spawn. 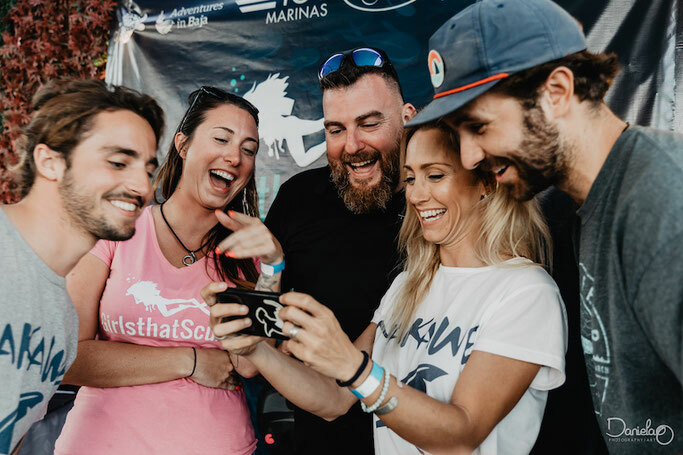 This is particularly problematic because this is when many fishing tournaments occur where anglers are targeting the largest marlin they can catch, which may be females on the verge of spawning. Some of these tournaments are “catch and release” and claim no harm to the individual fish caught, but this is very likely untrue. Previous research has shown that catch & release programs do not help, with the data showing that 100% of those bleeding from their gills and 63% of those hooked deeply die within 5 days of being released. Join us in November for not only the experience of a lifetime, but to help protect these incredible animals. 50% of all profits from these expeditions are being donated to Nakawe Project to help fund their awesome marine conservation work & research! This is a special limited offer series of citizen science expeditions. All prices are per person and on shared double occupancy basis. If you are traveling solo, no problem! We will match you with another Girl that Freedives or if you prefer your own private room a single supplement upgrade is also available for an additional fee. Expedition package price is $1790 USD. ONLY 6 SPOTS. The trip price includes all in-water activities, citizen science research activities, presentations throughout the week, transfers from Dive Ninja HQ* to our base camp and return transport to Cabo, 4 nights accommodation in a local hotel on a shared double occupancy basis, a light breakfast on in-water days, lunch, snacks, & soft drinks onboard the boat, dune picnic, and park fees. 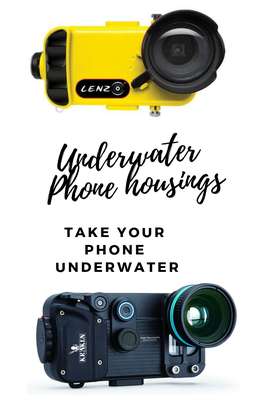 The price does not include flights, transfers from/to airport to/from Dive Ninjas HQ, rental equipment, Crew Gratuity (10%-15% of trip price is customary but is at your discretion), local dinners, 8% IVA (Mexican sales tax), or credit card processing fees. Please note that this expedition is not scuba diving based. All the action takes place at the surface so there is no need for scuba equipment. Plus the area is so remote that the nearest place to fill tanks is over 3 hours dive away. Additionally, to better preserve the natural behaviors of these animals it is best done as a soft interaction without bubbles and heavy equipment. You do not need to be scuba certified to join these expeditions, but you do need to know how to swim well and be comfortable swimming in the open ocean (20+ miles offshore). This trip departs from, and returns to, our headquarters in Cabo San Lucas, Mexico. The nearest airport is Los Cabos International (also known as San Jose del Cabo International Airport – airport code SJD). Guests also have the option to fly into La Paz International Airport (airport code LAP) and we can pick you up at the airport or in town on our way to Bahia Magdalena. On this trip you will be joined by GTS founder Sarah Richard as well as one of the epic Nakawe Team members and Dive Ninja staff. You will be carrying out citizen science projects to help save the marlins and learn while doing it.